Situated in Halls Gap directly below the Pinnacle (44 Royston Rd, Halls Gap) and set in bush surrounds you will find Pinnacle Haven Cottage. This well designed 3 bedroom holiday cottage provides views of the Wonderland Range directly from your lounge room. Your accommodation is set back into the bush in tranquil surroundings. From your veranda you can relax amongst nature and enjoy views of the surrounding mountain ranges. You will find two outdoor firepits one in the front yard and one in the back yard. We pride ourselves on offering our guests all that they need in a self-contained holiday cottage. The appliances and furniture are quality items and everything is well maintained and clean. The accommodation sleeps up to 6 people and is perfect for family holidays, couples or individuals. There are 2 queen beds and 1 double bed with all linen supplied. There is a gas heater as well as a split system air conditioner for extra heating in winter or cooling in summer. The bathroom has a spa bath as well as a separate shower. A gorgeous property, well-kept and fully equipped. Convenient location to amenities. Thank you for being such great owners, Daryl and Janet! House was great, very spacious inside and out, we made good use of the fire pit in the garden. There was abundance of birds visiting us and could see kangaroos across the road each day. Good proximity to the shops in Halls Gap and would recommend property to others visiting the area. Our family enjoyed being able to come 'home' after long hikes for a lunch break/dinner and spa. Everything was so close to our accommodation if we needed to duck out or go for a stroll. Very pleased with our stay and will return in the near future. We all enjoyed our stay at the cottage. Very clean, tidy and warm of course. Will recommend to others as well. 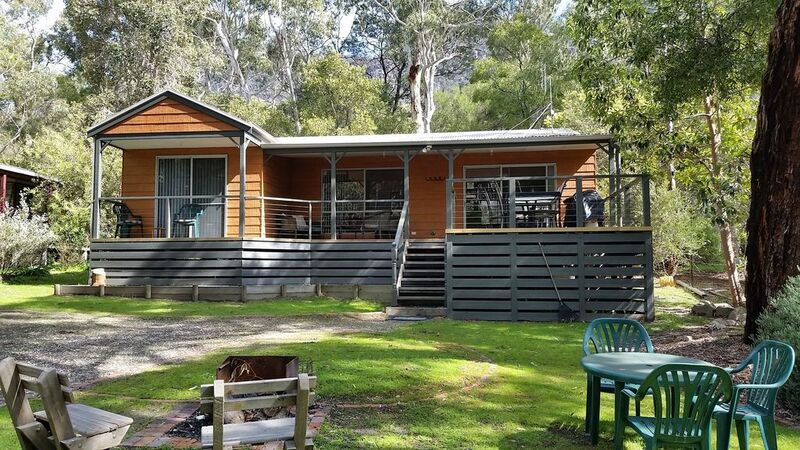 Had a wonderful time at this gorgeous property in Halls Gap. A view of the Pinnacle from the sitting room and a balcony at the front made it the perfect place to get away. The owners were easy to contact and very helpful with any requests we made. Thank you!